Everyone knows that our great green and blue planet is rammed full of weird critters. However, I am still impressed with the extent of strangeness that mother nature throws at us. 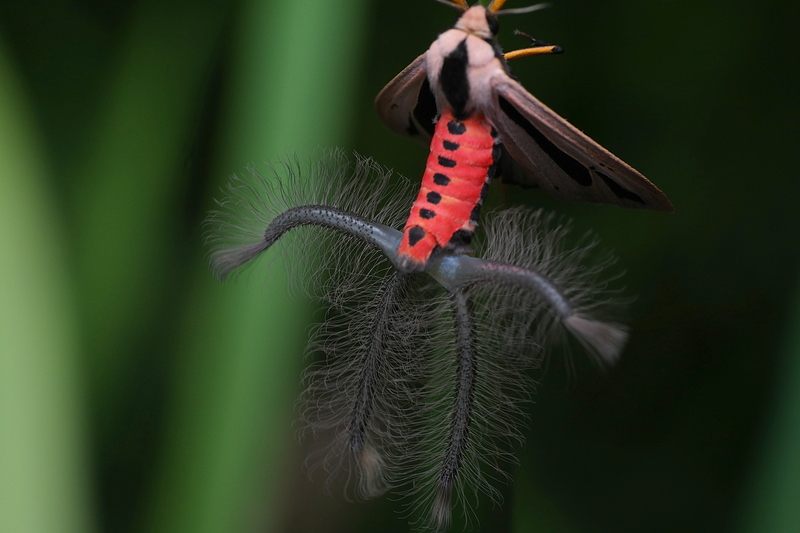 Recently, I came across the Creatonotos gangis moth. Its name forewarns you that it’s going to be obscure, and it doesn’t disappoint. 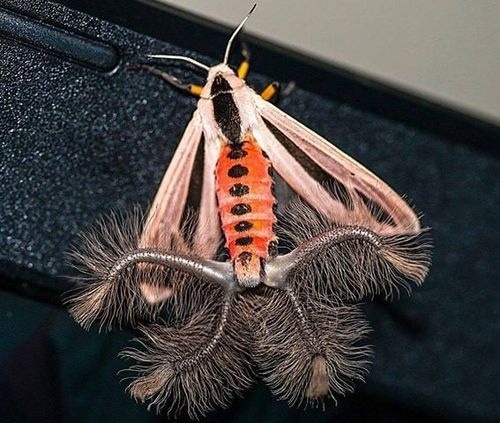 Creatonotos is an unassuming moth that lives in South-east Asia (China, India, Japan, Thailand) and northern Australia. These diminutive moths are famous for making a nuisance of themselves in pomegranate trees. 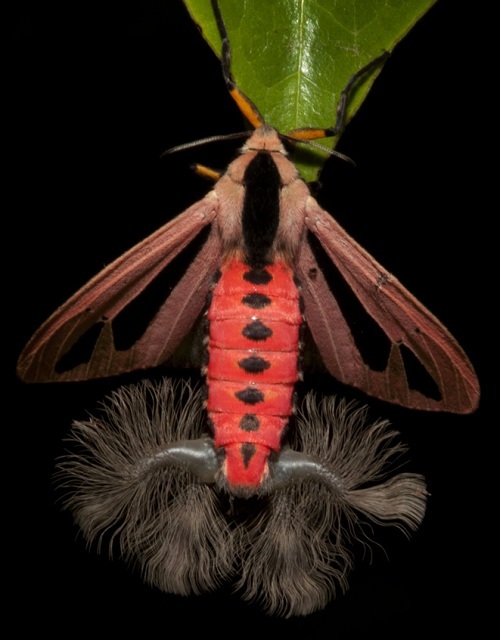 His white, black, red and yellow hues make him an attractive member of the moth family, but it’s not his colouring that initially draws the eye. 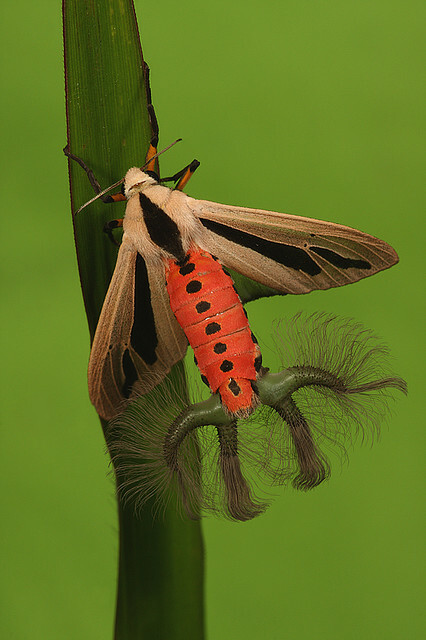 The moth’s characteristic that really turns heads are those massive furry things streaking away from the Creatonotos’ abdomen; those dangly organs are its scent organs, called coremata. 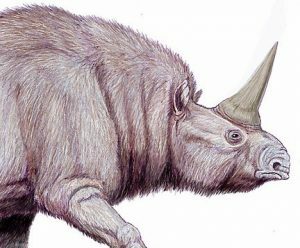 The coremata (or hair-pencils) produce the pheromone hydroxydanaidal to attract their mates. Now, it gets even more interesting. The caterpillars of the moth feed on plants which produce pyrrolizidine alkaloids (PAs). PAs are produced by many plants and, in general, they act as a deterrent to would be feeders. PAs are bitter to taste and can be toxic when consumed. 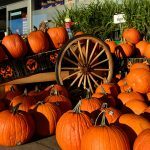 Often, a plant that has been damaged will increase its production of PAs, putting off other eager snackers. PA poisoning in cattle and sheep is a relatively common occurrence, and farmers have to be vigilant when it comes to the surrounding flora. So, back to our little Creatonotos. This little moth preferentially chooses plants with higher levels of PAs which, as you can imagine, gives it a bit of an advantage when he’s feeding, he has much less competition. If Creatonotos doesn’t get enough PA however, his impressive coremata won’t grow and he won’t be able to mate. In fact the more PAs he manages to save up, the longer and more impressive his coremata will be, and the more pheremone hydroxydanaidal he is able to produce. So, this little chap has evolved to enjoy the taste of bitter PAs, so that in the future, he will grow more impressive coremata and have more likelihood of passing on his genes. Incredible. What an amazingly odd little relationship, and what a weird looking moth.